Tombed is a dungeon-style game from 1 to 5 players. One is a Pharaoh, while the others play as one of the adventurers. The publisher 4 Dados and the creators of TOMBED Deep Pit Games have decided to relaunch the Kickstarter campaign. As you know, the tension associated with the campaign, along with some aspects of mutual inexperience in this type of launches, led us to the regrettable disagreement that many witnessed. But that is already in the past. Now, with all the disagreements solved, we restart process again with renewed enthusiasm to carry out the publication of the TOMBED game. For this we count on you, our faithful allies and those of whom we have learned a lot. Thanks to you, we hope to improve both the graphic aspects and the game elements themselves. It is fair to say, that the amount of comments from the project, the debate generated, beyond the simple comment are a guide from which we have learned a lot. Believe us when we say that they have not been in vain. Any criticism of the project in one way or another indicates a route to follow that we will be very aware of in the next launch. Now the Deep Pit union and 4 Dice is stronger than ever. Once we overcome the obstacles and with renewed strength we immerse ourselves in the work of preparing the rebirth of Tombed in the coming months. We hope to see you again in the re-launch and we trust that the changes and novelties that we have thought to add will be to your liking. Nuevamente en consonancia, la editorial 4 Dados y los creadores de TOMBED Deep Pit Games hemos decidido relanzar la campaÃ±a de Kickstarter. Como sabÃ©is la tensiÃ³n asociada a la campaÃ±a, a la par de algunos aspectos propios de la inexperiencia mutua en este tipo de lanzamientos, nos habÃ­a llevado al lamentable desacuerdo del que muchos fuisteis testigos. Pero eso esta ya en el pasado. Ahora, con las desavenencias solventadas, entramos de nuevo en el proceso con ilusiÃ³n renovada de llevar a cabo la publicaciÃ³n del juego TOMBED. Para ello contamos con vosotros, nuestros fieles aliados y de los que hemos aprendido mucho. Gracias a vosotros confiamos en poder mejorar tanto en los aspectos de imagen como en los propios elementos de juego. Es justo decir, que la cantidad de comentarios del proyecto, el debate generado, mas allÃ¡ del simple comentario son una guÃ­a de la que hemos aprendido mucho. Creadnos cuando decimos que no han sido en vano. Toda critica al proyecto en uno u otro sentido indica una ruta a seguir de la que estaremos muy pendientes en el prÃ³ximo lanzamiento. ¿ Y que nos depara el futuro? Ahora la uniÃ³n Deep Pit y 4 Dados es mÃ¡s fuerte que nunca. Una vez superados los escollos y con fuerzas renovadas nos sumergimos en la labor de preparar el renacimiento de Tombed en los prÃ³ximos meses. Esperamos veros de nuevo en el relanzamiento y confiamos que los cambios y novedades que hemos pensado aÃ±adir resulten de vuestro agrado. Today, after some considerations, the campaign returns with all his strength. As you surely saw, there are some changes, reflecting all the things that happened in the previous days. Now we are under 40k, but we will try to go up again! You will see 2 new pledge levels, Explorers Faith/la fe de los exploradores. These pledge levels will remain actives until the end of the campaign. Also, the SG are redone. If we arrive to 40K not only the game will be unlocked, but also the solo mode (yes, I wrote solo mode: we are finishing it). All the necessary material to have the base game is ready, so the game will be done in one year if we fund the game. If you want, the game will see the light. We can do it, guys, so hurry up! We want to inform you that since the update we did yesterday we have focused all our efforts to reach a satisfactory solution for all parties. Our legal team has recommended us not to enter into disqualifications and / or accusations, for which we have taken the decision, to calm the spirits, to not intervene beyond what is strictly necessary in the forums. That may have given the impression that we were hiding, but it's not the case. It's an attempt to redirect the situation. Our only interest at this time is to reach an agreement between the parties, and we will be in it until the end, no matter what it costs. We are not going to give up, our interest is that you can see the game on your shelves in a year, or maybe in some more time if we reach an agreement and the campaign is relaunched later. Queremos informaros que desde el comunicado de ayer hemos centrado todos nuestros esfuerzos en llegar a una soluciÃ³n satisfactoria para todas las partes. Nuestro equipo legal nos ha recomendado no entrar en descalificaciones y/o acusaciones, por lo que hemos tomado la decisiÃ³n, para serenar los Ã¡nimos, de no intervenir mÃ¡s allÃ¡ de lo estrictamente necesario en los foros. Eso tal vez haya dado la impresiÃ³n de que nos escondÃ­amos, pero ni mucho menos es el caso. Es un intento de reconducir la situaciÃ³n. Nuestro Ãºnico interÃ©s en este momento es llegar a una soluciÃ³n dialogada entre las partes, y estaremos en ello hasta el final, no importa lo que cueste. No nos vamos a rendir, nuestro interÃ©s es que podÃ¡is ver el juego en vuestras estanterÃ­as en un aÃ±o, o en algo mÃ¡s de tiempo si llegamos a un acuerdo y la campaÃ±a se relanza mÃ¡s adelante. As you surely know, this KS was born from the association of two companies, Deep Pit Games, the authors of the game, and 4Dados, the publisher that tooks the risk of its launch. This union was based on contracts agreed by the parties, where the responsibilities of each of the parties were established. Unfortunately, in 4Dados now we understand why no other company accepted to work with Deep Pit in the past. Now Deep Pit has decided that it does not have to fulfill its part of the contract, and he tried to impose us to cancel the project in order to break our contract. When we tried to continue the campaign, they decided to blame us with a public message. We will not answer their slanders on the advice of our lawyers. We want to clarify that we put all our energy in this campaign, and of course we will put it again. We consider that we have a responsibility with our backers, no matter Deep Pit did when they decide to leave you alone. We have the rights of the game, and the campaign will continue. For us as a publisher, this is the first time we saw a creator broke the contract in this way. We work wih 4 other designers in our line of products, and we didn't have these kind of problems in any way. for them, and also for us, a contract is a contract, and responsibility is one of the most important things in this world. That's why we will continue with this campaign. We understand that you may be worried, but the game will be published by us if the campaign goes well. This is our resposibility, and we don't want to leave you alone. Some of you surely saw that I was absent in the KS forum. The reason was quite simple: my daughter played a basketball championship... and she won! A nice way to have a little quality time with her. Nice matches, nice team. But let's speak about the SSG unlocked today. 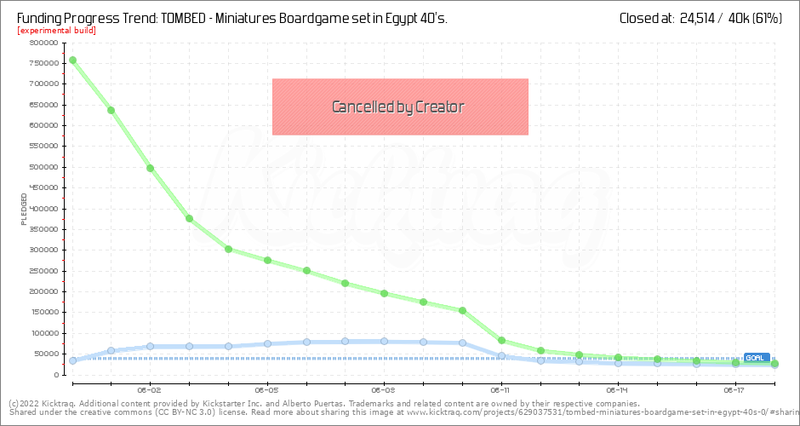 We arrived to 250 fans in BGG, so the third SSG is now unlocked! 3 new relic cards added to all your base games... let's try to arrive to 500 fans. As Alberto told you today, we are working in the finished english rules. You will have them ready to download this week, don't worry. Also, we are reading all your proposals for the campaign. We want to use them as a guide for the future, just because you are the soul of this campaign. We decided to ask to our backers every change and proposition we have for the campaign. also, we don ¡t want to have more add-ons. Maybe in the future, if they are unlocked, but all the SG that you can see are SGs, not add-ons, and we don't want to change this.